1. 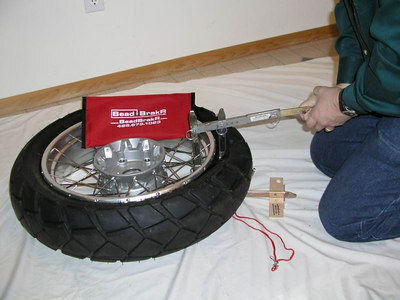 Remove wheel from the bike. 2. 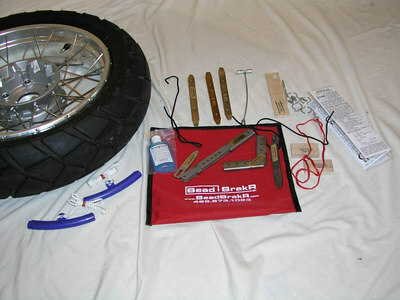 Open the BeadBrakR pouch and lay out the parts. 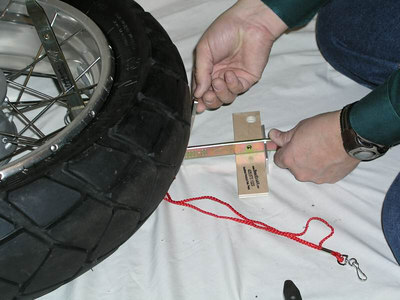 Note that the red lanyard holds all the quick release pins; remove the pins from the lanyard before you begin. 3. 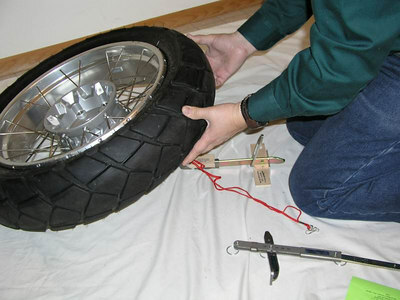 Use the Valve Stem Multi-Tool to deflate the tire and remove the valve stem. 4. 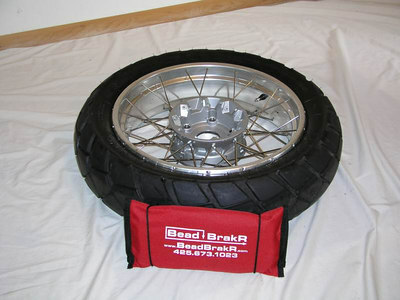 Assemble the BeadBrakR. The illustrated instruction sheet walks you through each step. 5. 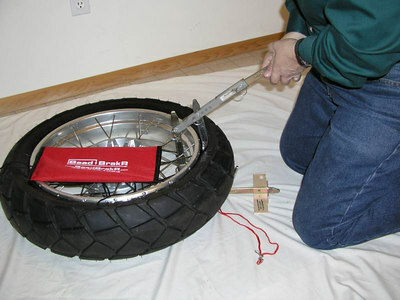 Here a tire iron is being pinned vertically into the Corner. 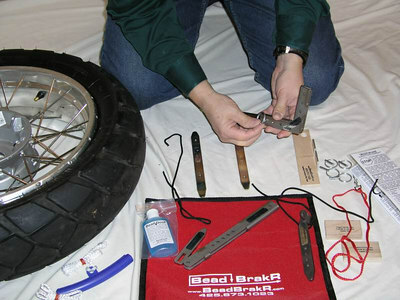 The "sand foot" is on the left side of the horizontal tire iron. 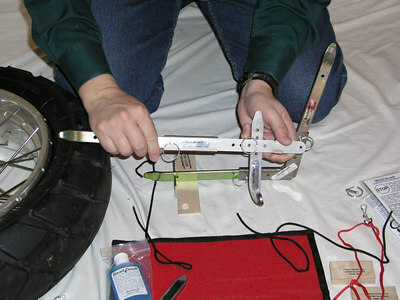 The sandfoot keeps the device upright during assembly and keeps it from digging into soft earth. 6. 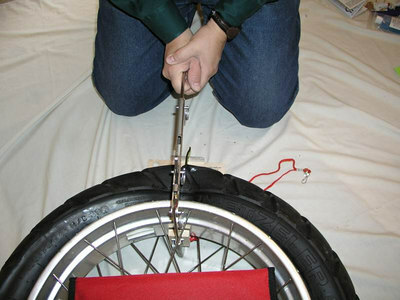 Here a tire iron is being pinned into the Lever. 7. 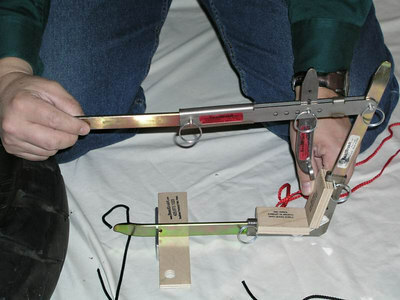 Here the Lever has a tire iron in place. 8. 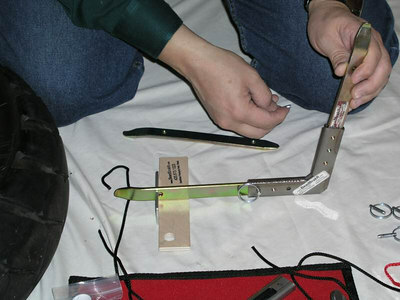 Here the Plunger is being fitted to the Lever. 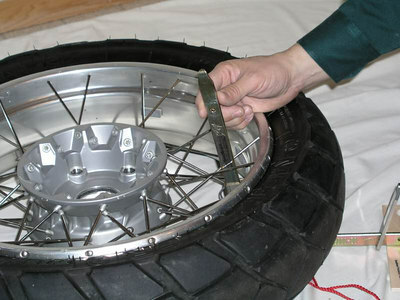 Note the multiple assembly holes that allow you to adjust for different size tires and rims. 9. 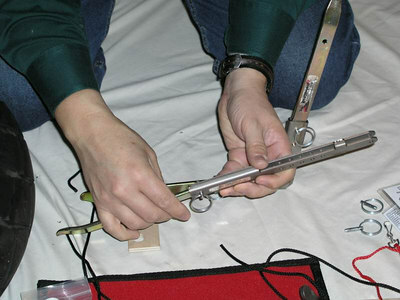 Here we're showing the Lever fully assembled with the Plunger. 10. 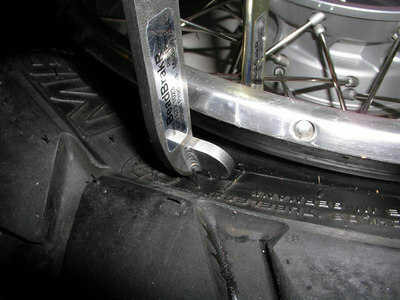 We've fitted the Lever to the vertical tire iron, and snapped the two plywood blocks in place on the Corner; they protect the rim from scratches. 11. 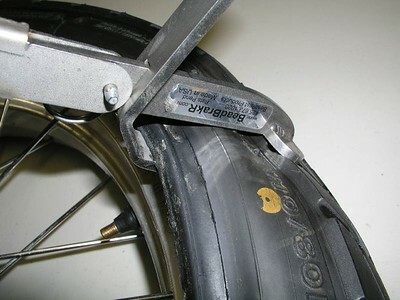 We slipped the Lock Bar onto the horizontal tire iron. 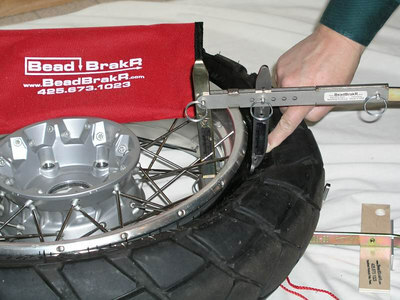 The Lock Bar prevents movement of the BeadBrakR in relation to the tire. 12. 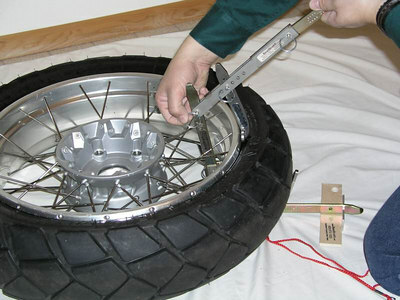 After full assembly, pull the pin holding the Lever to the upright tire iron, and set the Lever aside. 13. 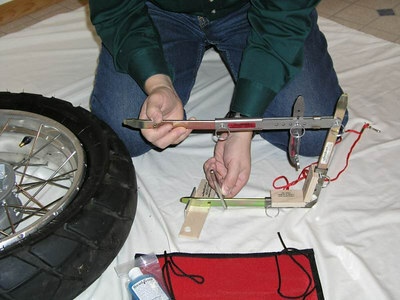 Lift the wheel and lower it onto the vertical tire iron. 14. 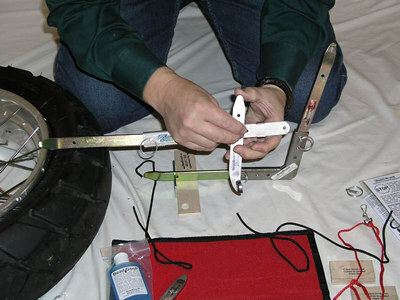 Lowering the wheel into place. 15. The vertical tire iron is fitted up thru a wide spot in the spokes. 16. 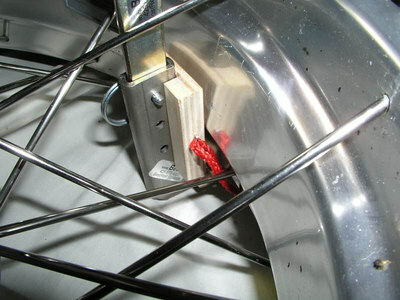 Make sure the plywood blocks are in place on the Corner; they protect the rim from scratches. 18. 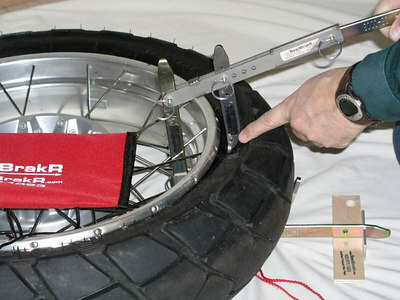 Reattach the Lever to the upright tire iron. 19. 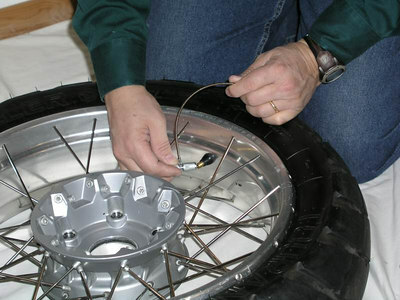 Adjust the Plunger so it's nearly VERTICAL above the tire, and so the end of the Plunger contacts the tire about 1/2" from the rim. 20. 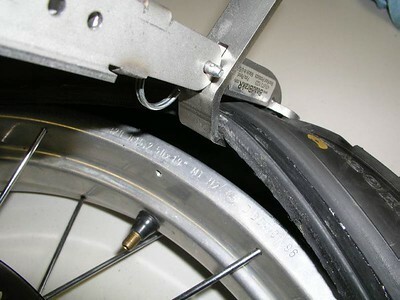 Position yourself so you're facing the tire. Kneel down so the sandfoot is between your knees. 21. Another view showing proper position of your body. Use both hands on the end of the Lever. 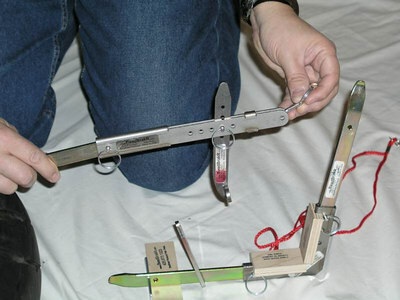 Use both arms to keep the Lever from twisting to the side. 23. Press down on the end of the Lever SLOWLY. Don't pound on it, jump on it, or otherwise force it. Adjust the position of the Plunger if needed. It make take two or more attempts to get the bead to break. 24. 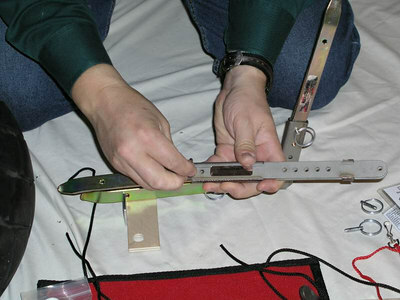 Here we see the bead beginning to separate. 25. 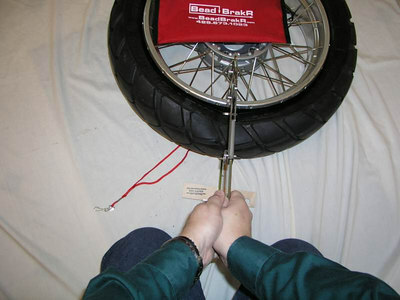 As you press down on the end of the Lever, the Plunger will depress the sidewall and the bead will break free. 26. 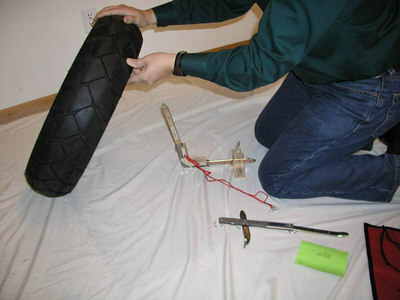 Here's a closeup of the end of the Plunger, showing the bead broken free from the rim. 26. 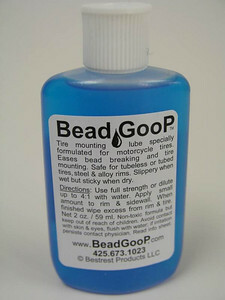 Once both beads are free of the rim, use some BeadGoop on the rim and the tire bead to make the tire demounting / mounting process easy. 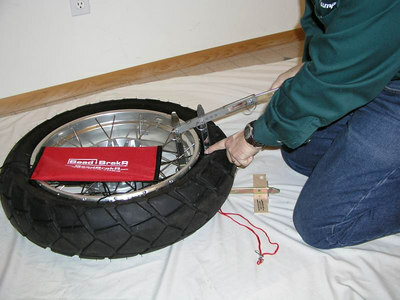 The key to efficient tire changing is not the size of the tire irons, its all about proper technique and plenty of tire lube.